Structured procrastination begins with prioritizing your tasks by deadline and importance. Then you procrastinate doing the most important ones by tackling the others. Perry even suggests a way to avoid potential procrastination consequences: actively seeking out tasks with artificial importance and artificial deadlines to keep at the top of the list. Procrastinators, he noted, are most motivated by deadlines — frequently after they’ve passed. As a fellow procrastinator, I knew too well what he was talking about. Back in college I had even developed a similar strategy called ‘creative procrastination’. Creative procrastination involved doing laundry, cleaning my room, studying for a different subject — doing ANYTHING that needed to be done but that was NOT what I was supposed to be doing. Don’t worry, I did get around to the important tasks — once the approaching deadlines became daunting. And, boy, did I have a lovely dorm room! 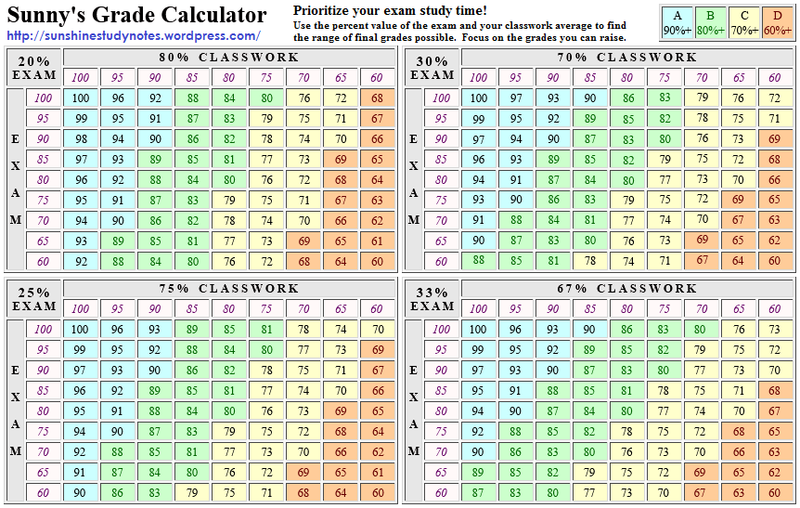 This chart, along with the exam’s percent of the final grade and your current average, shows the range of potential final grades. Sometimes it just doesn’t make sense to knock yourself out studying when that desired grade is out of reach. Now don’t misunderstand me, this chart was very helpful throughout my college career. And after I posted it on my dorm door, my classmates went out of their way to consult it. It is a very useful tool but it was not the most important task at the time. It allows me time to think about the project, planning all the steps and considering any potential pitfalls before I begin. It also limits the number of edits that a perfectionist is bound to make. Believe me, you can really wreck something by over-editing it — not to mention wrecking yourself by never calling it ‘done’. So I support John Perry’s structured procrastination strategy and recommend it to my fellow procrastinators — as long as you do eventually meet your deadlines!